Amish Wagon Works: Amish Wagons for Kids! 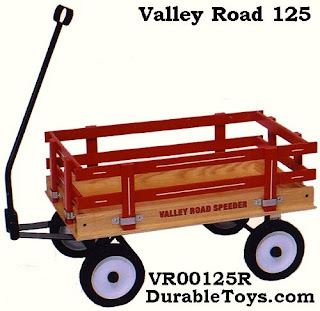 Does your kid love to pull his toys in a wagon, but your wagon is just too big? 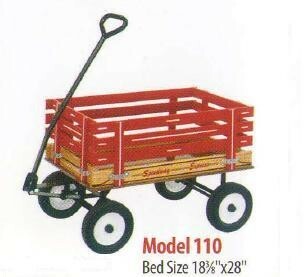 We have Amish-made wagons that are just kid-sized! The Berlin P-Wee Flyer is our smallest at only 26.5 inches long and15.5 inches wide. 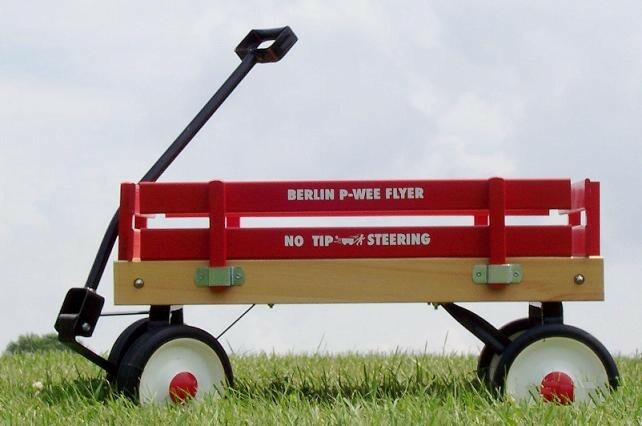 It is perfect for your little one who would love a wagon his or her own! Similar is size is the Valley Road Speeder Model 125, which is 16" x 28". It is available in Red, Blue, Pink, and Green with yellow wheels. This wagon is a little larger at 18" x 28", and has higher racks. It has the most color options as it is available in Red, Blue, Green with yellow wheels, Pink, and Oliver green with white wheels. If you think your child might want a larger wagon yet, the Speedway Express Model 128 is 19 3/8" by 33". It is also available in all of the color options that the 110 Model is. Let the hauling fun begin!